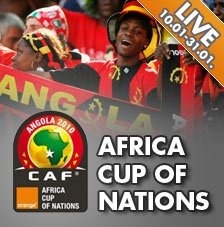 News 10.01.2010: The Afrika Cup 2010 in The World Live Score P2P TV !! 10.01.2010 - 31.01.2010 live stream in The World Live Score P2P TV !! Server World Live Score zve všechny ve dnech 10.01.- 31.01.2010 ke sledování zápasů Afrického poháru 2010 ! !